A CD, with a refreshing sound, from HEBRON! 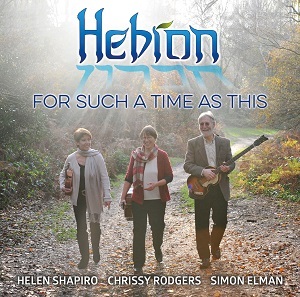 HEBRON, featuring Helen Shapiro, Chrissy Rodgers and Simon Elman, present their Biblical Messianic songs in a variety of styles, including Folk, Jazz, Blues, Bluegrass and Hebraic. With their close vocal harmonies and acoustic instruments (bass, guitars, ukuleles and banjo), Hebron’s music will, no doubt, have broad appeal. In these 16 tracks, most of them original, Hebron endeavours to declare a simple and clear Gospel message so needed today. The latest Gospel album by Helen Shapiro! Fifteen scriptural and uplifting tracks of worship, praise and exhortation. Helen's first Gospel album in 12 years. A compilation of Helen's first four gospel albums with a total of 35 songs! Available as a double CD. 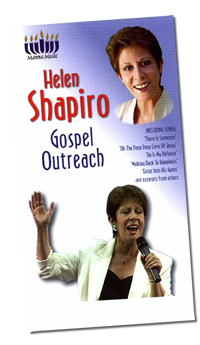 Recorded live, this superb DVD features Helen Shapiro sharing her remarkable story in word and song, presenting a powerful gospel challenge to both Jew and Gentile alike. 100 minutes. Includes: Walking Back to Happiness, He Is My Defence, Oh The Deep, Deep Love of Jesus and excerpts from others. Collection of five Jewish testimonies. A doctor of medicine, two rabbis, a businessman and a world-famous singer all make the greatest discovery of all. Recorded live, Helen shares her wonderful testimony and concludes with a direct, powerful Gospel message and challenge. Useful to give away to relatives and friends. N.B. - There is no singing on this recording. CD or audio cassette tape. Once you have completed your order, and added all the items you would like to purchase, click 'View Cart' to the right and complete the PayPal Checkout Process. Then select 'View Cart' and follow the PayPal checkout process. Click one of the links below to download our order form which you can complete and return via post.